Fans of the world's most mischievous monkey may find themselves in search of a Curious George book list. Curious George is a monkey who stars in a series of children's books created by husband and wife team Hans Augusto Rey and Margret Rey. H.A. Rey is generally credited for the illustrations and Margret Rey is credited for the writing, although the pair has often said the books were a collaborative effort. Curious George lives in a large city with a character known simply as "the Man with the Yellow Hat." He gets into many amusing adventures, but is always rescued before he can cause serious damage. And, much to the delight of young readers, everyone is quick to forgive Curious George for his mistakes. More than 30,000,000 Curious George books have been sold throughout the world. Curious George books are available in 14 different languages. Curious George is the star of an animated PBS television series that began in 2006. While H.A. and Margaret Rey are always credited on the cover of Curious George books, only seven titles were actually released during H.A. Rey's lifetime. These seven books are sometimes referred to as the "original adventures" by fans and collectors of Curious George memorabilia. However, it is interesting to note that the very first appearance of Curious George was in another children's book published by H.A. Rey in 1939. Cecily G. and the Nine Monkeys tells the story of a giraffe who befriends Curious George and his eight monkey companions. After H.A. 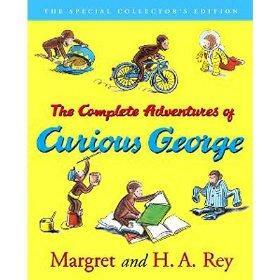 Rey's death in 1977, Margret Rey began working with Alan J. Shalleck on a second series of Curious George books. Published between 1984 and 1993, these books are now mostly out of print. Some of the most popular titles have been re-released with new cover art, however. Houghton Mifflin Books has a complete listing of Curious George books currently available for purchase, including Spanish titles, board books, books based on the animated movie, and books with accompanying audio CDs. However, you may want to keep in mind that this list was compiled in 2006. Since Curious George's popularity shows no sign of waning, you can expect more books to be released each year! Curious G: If you're interested in purchasing stuffed animals, posters, clothes, and other memorabilia in addition to Curious George books, you might want to check out the selection of products available on this Web site dedicated to everyone's favorite monkey. Curious George Games and Activities: This page includes a number of fun things for Curious George fans to explore, including a recipe for banana bread, instructions for how to draw Curious George, and a printable party kit. Curiosity Kit: This PDF guidebook has suggestions for planning a Curious George themed reading celebration, as well as printable coloring pages, mazes, word searches, and activity sheets for young Curious George fans to enjoy.